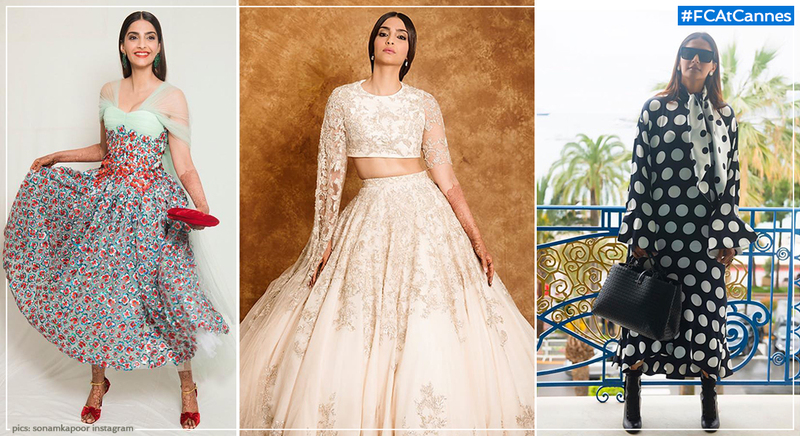 10 SECOND TAKE: Sonam Kapoor Ahuja is back at Cannes to flaunt her fashion smarts, and it’s the moment we’ve all waited for. You can count on her to throttle indie brands into the mainstream consciousness. We got a taste of that at the get go, when she stepped out in a polka-dotted dress by London favourite Mother of Pearl. Spanish label Delpozo, loved for its constructions and unique brand of prêt-a-couture, got an outing too. A good measure of a brand’s buzzworthiness is their retail footprint. Typically, a combination of retail heavyweights like Net-a-porter, Bergdorf Goodman, Saks, Moda Operandi will snap them up young. The fact that Mother of Pearl can be found on all of the above, speaks of its calibre. The actor chose their ‘Madison’ dress from the Spring Summer 2018 edit. Their collection is equal parts romantic and whimsical, pairing masculine pinstripes with ruffles and pearls. The London-based label, by designer duo Tamara Ralph and Michael Russo, is one she’s consistently championed and among the few she’s catapulted into the Indian mainstream. The actor wore a pretty, custom-made lehenga by the London-based couture house. If the goal is to wear an all-out traditional look, complete with a jada choti from Amrapali Jewels, then it begs the question: why not work in tandem with an Indian label and show them some love? Her trusted Anamika Khanna and Abu Jani-Sandeep Khosla could’ve done the job just fine too. The Spanish label helmed by designer Josep Font, marries precise constructions with exquisite details. Founded in 1974, in Madrid, the brand springboarded on to the international fashion consciousness as late as 2013, with their New York Fashion Week debut. For a charity dinner, the actor chose a pretty – but hardly memorable – dress by the label. Perhaps it’s just that we’ve come to expect so much more of her. Fresh, minimal makeup with hair pulled back might have served to elevate the look too.